HARD HITTING DETROIT LIONS FORUM - View topic - Cleaning House... Reportedly KVB is Cut too!!! Cleaning House... Reportedly KVB is Cut too!!! I like it... Keep 'em comin'. I really thought they were going to seek to restructure his deal. Most of what was due was non-guaranteed salary. I thought they could have easily cut his cap # in 1/2 and kept him around at least as a solid DE and lockerroom leader. I wonder how this will impact Suh, not having a vocal leader on the DL to temper him. Re: Cleaning House... Reportedly KVB is Cut too!!! Mike Garafolo of USA Today reports that the team has informed KVB that he will be released. It's sad to see him go, he's one of the very few "professionals" in the Lions locker room, especially on the defensive side. I wouldn't be surprised if they sign him to a cheaper deal in FA, but that just might be wishful thinking. Yay! Bring him back as the DL coach if they want. Seems like a good fit in that role. I would assume thats what they are doing - Release now to confirm the impact on the books, give him a chance to go get a better deal than we can offer, if he doesnt find one offer him a min (or near min) contract to be our BACKUP DE, since that is where he is at in his career, at best. 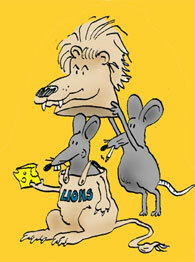 good moves by the lions today. will need to add some players though but at least this opens up some cap space to make such moves. i expect stafford to get restructured soon, maybe suh to get restructured. Looking like my Way too early draft prediction for the Lions just might come true. Regardless, it was a good move that had to be done. Nate Burleson on the books for $6,531,642 and $7,531,642 the next 2 years. Dominic Raiola has one year left at $6,312,500. Mike Thomas did nothing after the trade to earn 3,450,000 and 3,710,000 the next 2 years. Yes I pretty much want to start over on the offensive line and with the receivers not named Calvin Johnson. Mike Thomas' 2013 salary is $1.45 million, and he'll likely be our KR/PR guy too. It would only save about $500k to cut Nate B right now because Mayhew has restructured his K so many times and all he does is makes a portion of his salary guaranteed later. Fun fact, we would have saved around $3 mill if we cut him last year, and his entire salary this year if we cut him before restructuring his deal... And you guys think Mayhew is a good GM? Last I checked a good portion of Backus' K was guaranteed as well. I liked KVB's motor and work ethic, but due to his age his play has been on the decline. Good move cap wise, but tough to cut a pro like him, especially with his relationship with Jimmy. Everybody's getting excited about cutting KVB and letting Avril go...quick question though--who's gonna start on our line next season? I'd look at Dwight Freeney to replace Avril for a year or two. If he comes cheap due to age he could probably do some good damage in the Wide-9 and with all the one on one situations he'd have. Avril is not signing a back loaded contract without a lot of guaranteed money, he's got an overinflated value due to his position and playing in a pass rushing system. He can't play the run at all and goes invisible in games a lot, so he's just not worth the money he wants. He was also a Millen 3rd round pick, he is replaceable without spending a 1st or 2nd rounder in this years draft. Replacing KVB should be the easiest thing to do since he added very little on the field this last season. Replacing KVB should be the easiest thing to do since he added very little on the field this last season. You're not trying to replace 2012 KVB. You're trying to replace 2011 KVB. It doesn't matter what round Avril was picked in, he turned into a first round talent (if you don't believe me just look at how many first round DEs were complete flops). If you could find DEs like Avril regularly in the 3rd round they wouldn't command $10 million per in FA.